GEORGETOWN, Texas (Blugolds.com) -The men's and women's tennis teams continued their spring break trip with a stop in Georgetown, Texas to play Southwestern University on Wednesday night. Both teams fell to the Pirates 7-2. 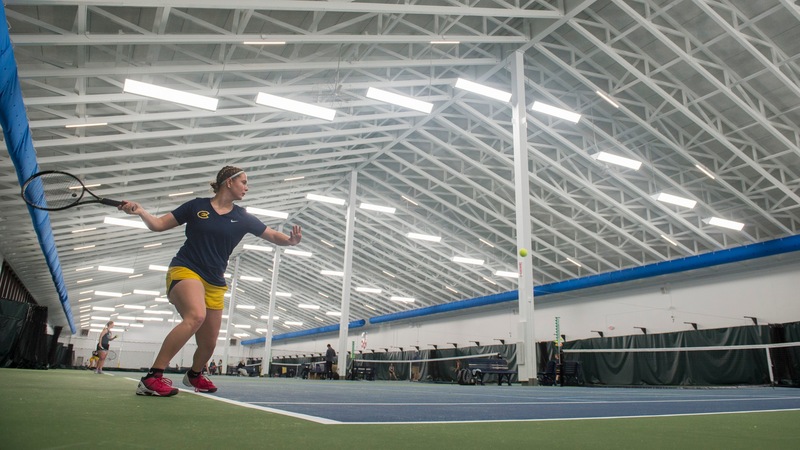 For the women's team, Lindsey Henderson (Prior Lake, Minn.) and Alexa Brooks (Beaver Dam, Wis.) were able to put the Blugolds on the board in doubles play. The duo defeated Bartusov/Elez (SWU) 8-7 at the number three doubles slot. Southwestern took their momentum from doubles into singles playing winning all but one singles match. Molly Stewart (Amery, WI) was the bright spot in singles play earning the Blugolds only singles point at number three singles. This is the first loss for the women's team since August. On the men's side the Blugolds dropped all three doubles matches but were able to win two of six singles matches. Matt Christensen (Rochester, Minn. /Century) defeated Hunter Bajoit (SWU) 6-3, 1-6, 7-6 at number two singles, and Grant Mauthe (Neenah, Wis.) took down Max Pearson (SWU) 6-3, 5-7, 11-9 at number five singles. The Blugold men are now 11-3 on the year. Both team will take on Trinity (TX) today March 28 at 4:00pm. Follow the Blugolds on Blugold Game Day or on the 'UWEC Blugolds' app' on your mobile device.